My permaculture friend Todd always likes to pepper everyday conversation, somewhat tongue-in-cheek, with the term “pollution”. You see, in the course we did together, we were given a new perspective on the concept of pollution – which was redefined – not as something absolute and evil, but rather as a surplus of any resource for which a use has yet to be found. To offer an example of how this works: in a forum I attended a few days ago in Bundanon, Pia Winberg, an environmental scientist at University of Wollongong drew attention to the untapped potential of seeweed as an Australian Industry. For Pia, seeweed is great because you can grow a lot of it in salty water (sidestepping the salinity problem), and it can be used to mop up some of the destructive nitrogen and phosphorus “pollution” created by fish farming industries. In other words, if you locate a seeweed farm near a fish farm, the pollution from the fish farm becomes, rather, a resource for the seeweed farm. Which brings me to a looming issue. There’s only one month to go on the In the Balance exhibition at the MCA. What will happen with all the stuff used to put together the show, when it finishes? Here’s a curiosity. 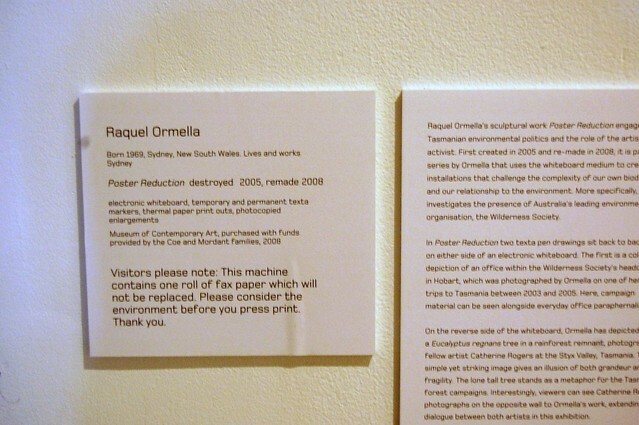 The above image is a rather blurry photograph I took in the MCA gallery, showing the title wall label for Raquel Ormella‘s artwork in the In the Balance exhibition. The work, entitled “Poster Reduction”, consists of an electronic whiteboard with two marker-pen drawings: on one side, a majestic Tasmanian tree in the forest, and on the other, a depiction of the offices of The Wilderness Society (the nerve centre of that organisation’s campaign to save the forest). 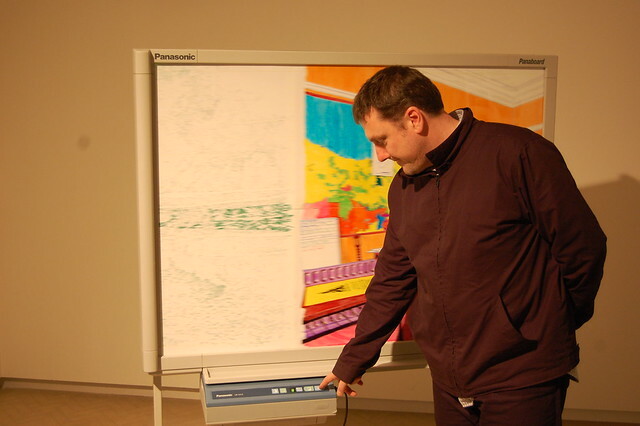 Gallery visitors can view each image in rotation, by pressing a button on the whiteboard control panel. The other thing that the whiteboard does is to produce “thermal fax paper” type print-outs of the image on the whiteboard. 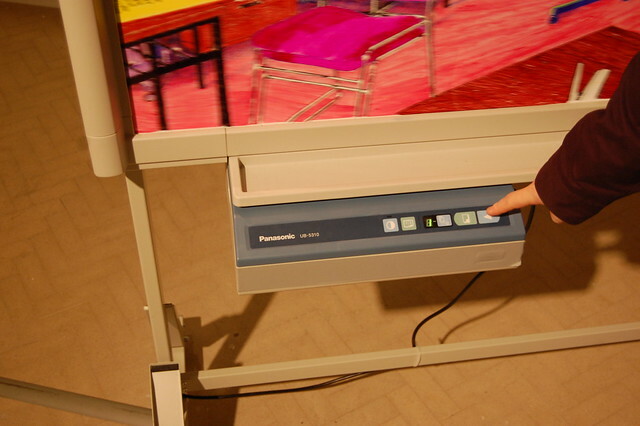 By what miraculous scanning process this works, I am not sure, but it’s pretty cool. This work has been exhibited elsewhere (notably, at The Performance Space in 2005), and in its previous manifestations, it spat out lots of this thermal paper, which built up in a nice dishevelled pile underneath the whiteboard. But on the day that I tried to print – a few weeks ago – the fax paper was already finished. While this hot controversy has been brewing, Raquel has been out of town – exhibiting in Japan and Melbourne – and she’s just returned. Glenn, the curator, has also been away – in Korea doing research for an exhibition next year – and he also has just returned to Sydney. Last Thursday in the gallery, they both visited my audit office. They asked me to make space here on the Audit blog for a discussion about this aspect of Raquel’s work. It seems that the two are not, shall we say, in perfect alignment vis-a-vis the title text describing the issue of the purported finitude of the fax paper. I’ll say no more, but allow our two protagonists to debate it out in the comments below. Keep it clean, team! Before they left our fine city to return to their home in Daylesford, Meg and Patrick from The Artist as Family wanted to do an “auto-audit”. We met at their Food Forest, recently embedded at the St Michael’s Church on Albion Street in Surry Hills. Adjacent to the garden, we all set to munching on Maltese Pastizzi I’d fetched from up the road, ripping out big chunks of just-grown lettuce from the nearby soil to help mop up the grease. This is the second in my series of audits on the work of artists featured in the In the Balance exhibition. 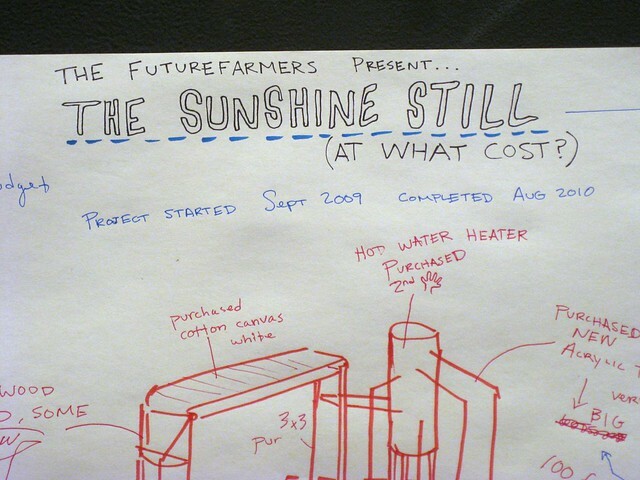 The first was the work of San-Francisco collective Future Farmers, which I detailed here. I really enjoy this process. 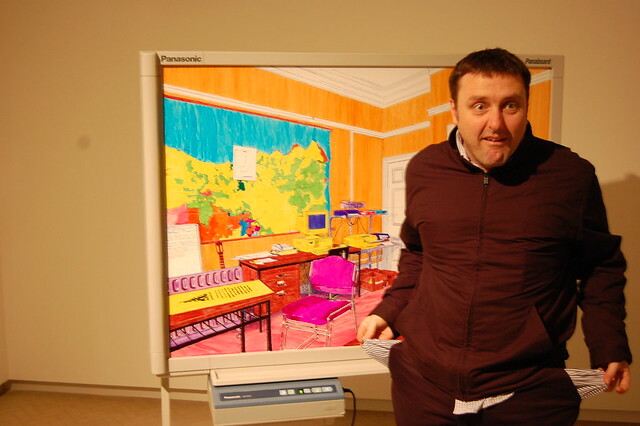 Basically the artist(s) sit down with a huge piece of paper, and many coloured textas, thick and thin, and begin the process of coaxing-to-consciousness their own working methods. Starting from a particular point of view (for instance, the product of a particular creative endeavour) they begin to map as thoroughly as possible everything that went into it, and everything that comes out of it. 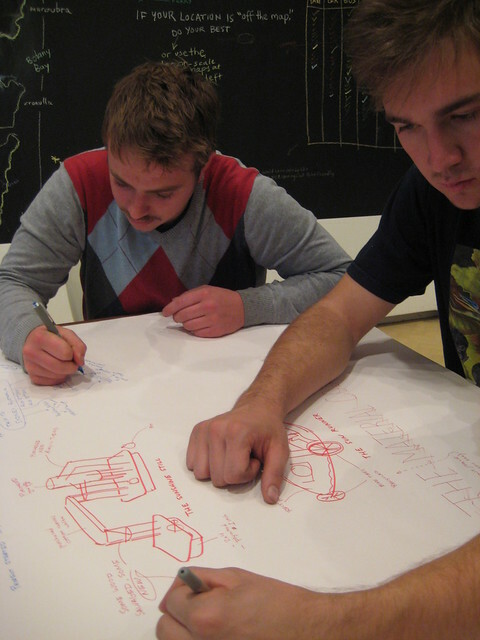 Last Saturday, after their artists’ talk, Dan Allende and Ian Cox from FutureFarmers descended on the Environmental Audit office at the MCA to carry out an auto-audit on their own project. Here they are, deep in concentration. The auto-audit is a process by which the artists themselves revisit the entire lifecycle of their project to date, trying to dredge up in their memory all the processes and materials which went into its making. I sit with them, suggesting things they might have forgotten, asking questions about the story of the work, and generally trying to stop them from tearing their hair out and running away from the task at hand.